March 24, 2016 – Thursday’s Jacinto City’s Council Meeting was full of words of praises along with award presentations by Mayor Ana Diaz and Fire Chief Rebecca Mier to members of the Fire Department’s Emergency First Responder’s Unit and a 911 Police Dispatcher for their successful response to a 911 Emergency hang-up call. It was Valentine’s Day February 14th when the family of Roger Matheny who’s known for his years of being Santa Claus as he rides the fire engine truck throughout the city giving candy stockings to the kids discovered that his 3 year old grandson Joshua Matheny Jr. was missing from within the house where family members had gathered for a visit. After Miguel rescued his drowning cousin from the pool he began applying Cardiopulmonary Resuscitation (CPR) techniques he’d seen on television. Police Dispatcher Tatiana Viana received a 911 emergency call from the address but for some unknown reason the call disconnected before Dispatcher Viana could inquire about the nature of the call. Dispatcher Viana following the city’s 911 emergency call procedures quickly passed the hang-up call’s address to the fire department’s First Responder’s unit in which one of the city’s paramedics’ scrambled a first-out-unit to the location while a second rescue unit quickly followed. Upon arrival the First Responders took control of what appeared to be a child drowning victim. They immediately began life saving resuscitation techniques to the child whose skin had turned blue from being submerged in water. Last’s year auctioning of the Reserve Grand Champion steer. 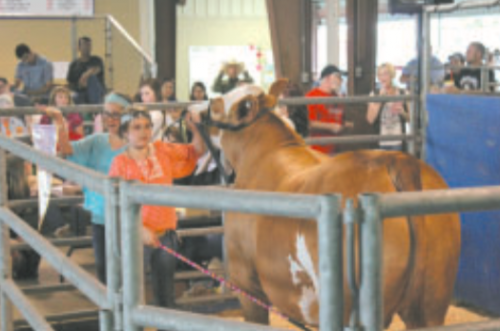 The Channelview FFA will hold its 53rd annual Livestock Show April 4-9 at the Allen Hall Fairgrounds, located on Wood Drive in Channelview. The FFA will host a horticulture plant sale at the Channelview High School greenhouse from 8 a.m. until 2 p.m. on Monday, April 4. Show activities will begin Tuesday night at 6 p.m. with the broiler show, followed by the meat pen of rabbits show and concluding with the breeding rabbits. Move in and weighing of all the market animals will occur on April 6. Later that evening, the sheep and meat goat shows will start at 6:30 p.m. The home economics non-food items will move in Thursday, April 7, from 3 to 6 p.m. and the swine show will begin at 6:30 p.m. On Friday, April 8, the adult and student home economics exhibits will move in from 7-9 a.m. with the judging at 11 a.m. Later that day, the cattle show will be held starting at 6:30 p.m.
Harris County Attorney Vince Ryan, along with Texas Attorney General Ken Paxton, won a temporary restraining order last week against a La Porte Freeway gas station and convenience store to stop the retail sale of synthetic marijuana. Synthetic marijuana, also called “Kush,” is a designer drug, typically manufactured overseas, that is marketed as a “safe” and “legal” alternative to marijuana. Synthetic marijuana is not marijuana at all but a dried leafy substance that is sprayed with powerful, added-in hallucinogenic chemicals that are dangerous and highly addictive to the user. It is often marketed to children, and is the second most abused drug by high school students, after marijuana itself. Bailey accepts Stand Up for Texas Public Schools Award. For the past 20 years, Jason Bailey and Perdue Brandon Fielder Collins & Mott LLP have built a strong partnership that has greatly benefitted Channelview ISD schools. Bailey serves as the district’s tax attorney, but helping to provide for the needs of students is something he takes seriously. The longtime support of Bailey and Perdue Brandon Fielder Collins & Mott has earned them the Stand Up for Texas Public Schools Award, sponsored by the Texas Association of School Boards. 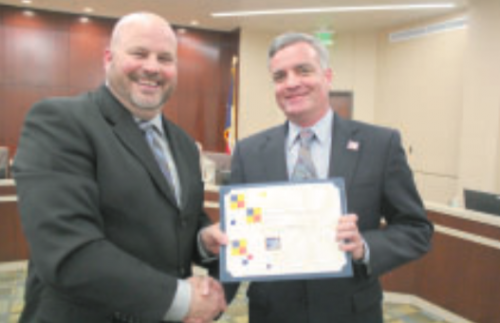 Bailey accepted the award on the firm’s behalf as part of a special recognition by the CISD Board of Trustees. Bailey and the law firm have supported a variety of programs and events in the district, including the B.H. Hamblen Scholarship Golf Tournament, in which they have been a sponsor for all 18 years of the event. In addition, the company has supported the annual Channelview FFA Livestock Show and Auction, along with the district Teacher of the Year awards ceremony. The company is a sustaining partner and Founding Donor to the Channelview ISD Education Foundation. Bailey also serves on the Board of Directors of the Foundation. Yvette Ariana Leos, a senior at Channelview High School, got 1st in class with her Breeding Duroc at the 2016 Houston Livestock Show and Rodeo on Friday, March 4, 2016. 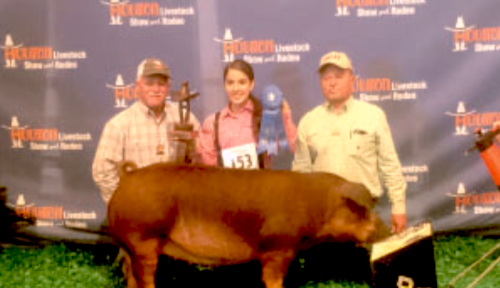 She purchased the Duroc with the money from the Calf scramble, which she caught in the San Antonio Livestock Show And Rodeo in 2015. She also showed her in San Antonio and got 10th in class on February 11th, 2016. Her teachers are Dominic Mosock and Wesley Hutchinson.